This is the oldest standing Icelandic Lutheran Church in Canada. It was built in 1889 by volunteers under the direction of carpenters Byring Hallgrimsson and Arni Sveinson. 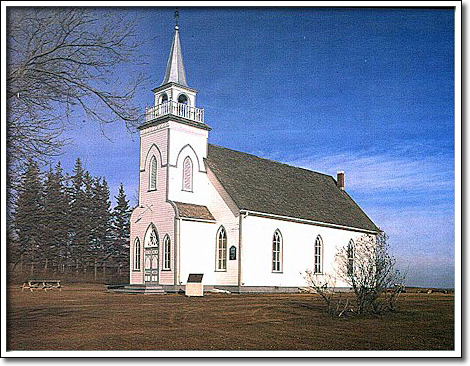 Grund Lutheran is representative of late nineteenth-century church architecture in rural Manitoba, a wood frame structure built on a simple rectangular plan. The prevailing taste for the Gothic Revival style is expressed here in pointed windows, and delicate window tracery on the tower. Many of the early congregation members had first settled at New Iceland (Gimli) in the late 1870s, before homesteading in the Municipality of Argyle in the 1880s. They were still living in log houses when they built this church which became the focal point of the community. In 1964, Frelsis Congregation joined Baldur Immanuel Lutheran Church.